Welcome to Tuskar Charters, run by myself - Stan Dickinson - offering boat charters for angling and diving around the north wales coast and Irish sea. I am based on the Wirral and my boat 'Tuskar', an Interceptor 33, is moored in the Mersey. Tuskar has a 60 mile C.O.P and I am trained to Yachtmaster level. >> Watch our film here and see what Tuskar has to offer. During the summer and winter months I specialise in sea fishing trips, fishing in Liverpool Bay and along the North Wales coast, and offer full rod and tackle hire. I am a keen angler myself with 30 years experience fishing the area. I have been chartering full time since 2005. Regular catches include Mackerel, Pollack, Top e, Bull Huss, Thornback Ray, Bream, Conger, Ling, Gurnard, Cod, Whiting, Pouting, among other species. View our Angling Gallery to view some great catches! All fish may be kept with the exception of Conger Eel, Bull Huss and Tope (usually first type of each species is allowed to be kept except for Tope). During the winter months, usually October - February, our fishing trips are all based within the River Mersey, where Cod, Whiting, Strap Conger, Pouting and Thornback Rays are regularly caught. 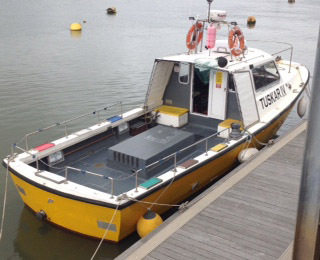 Tuskar can also be hired for commercial services such as diving, survey, crew change, safety boat, photography and has even appeared in a film! For diving Tuskar has an opening rear door with dive platform and ladder. Copies of my documents, including current Code Of Practice certificates can be viewed on board at any time. Copyright Tuskar Charters. All rights reserved.